A researcher now at the University of California, San Diego, Wanmin Wu, wrote the outstanding Ph.D. dissertation worldwide last year in the field of multimedia computing, communications and applications, according to an international jury of top experts. 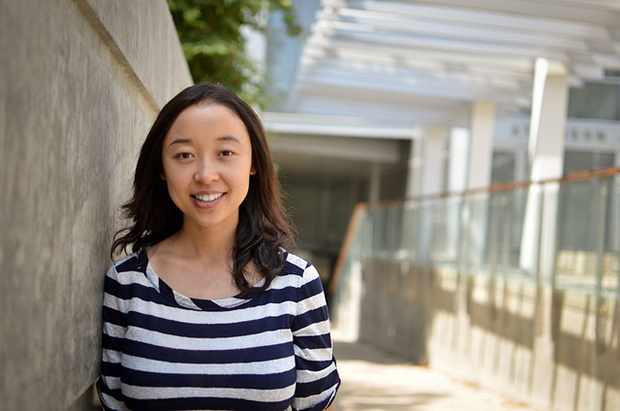 The ACM Special Interest Group on Multimedia (SIGMM) singles out one thesis each year for the award, and the 2012 honor went to Wu, who is a postdoctoral researcher in the Center for Wireless and Population Health Systems (CWPHS), part of the UC San Diego division of the California Institute for Telecommunications and Information Technology (Calit2). Resources in 3D Tele-immersive Systems,” to complete her Ph.D. at the University of Illinois at Urbana-Champaign in 2011. “Wu’s dissertation documents fundamental work in the area of unifying systems and user-centric approaches to managing information flows for supporting 3D tele-immersive environments,” according to the SIGMM Ph.D. Award Committee. At last year’s meeting, the computer scientist had one of two papers selected for the Best Student Paper Awards (from a field of over 650 submissions). Among earlier honors, Wu was one of only 12 students worldwide selected in 2008 as IBM Watson Emerging Leaders in Multimedia. Wu joined UC San Diego in August 2011. She has since been funded by National Institutes of Health on an interdisciplinary project through Integrating Data for Analysis, Anonymization and Sharing (iDASH), a National Center for Biomedical Computing. The research effort brought together scientists from public health, computer science, and engineering to create an effective and engaging tool for behavior pattern recognition and intervention. Wu, as the computer scientist and engineer on the team, developed smartphone applications on iOS and Android platforms to learn and classify common physical activities (such as sitting, standing, walking and jogging). She recently published her results in the Journal of Medical Internet Research. Wu is currently funded in part by the National Cancer Institute, through its Transdisciplinary Research on Energetics and Cancer (TREC) initiative, which explores the link between obesity and cancer. UC San Diego is one of four universities hosting TREC Research Centers. Led by Prof. Ruth Patterson, the UCSD center focuses on mechanisms linking obesity with breast-cancer risk and conducts studies investigating obesity and lifestyle factors related to insulin resistance and inflammation using mouse models, clinical trials, as well as wireless and networked technologies in the community. Wu is the principal investigator on a pilot TREC study of automatically analyzing behaviors and contexts in life-logging images. For her Ph.D. in Computer Science, Wu developed a theoretical framework for modeling and measuring Quality of Experience (QoE), and for correlating QoE with Quality of Service (QoS) in distributed, multi-modal, interactive environments. Significantly, Wu also introduced the importance of the user-centric approach to modeling and managing complex, three-dimensional data exchanges in time-constrained systems. Development of new methods for video coding, incorporating understanding of users’ psycho-physical understanding of color and depth. The new methods outlined by the ACM committee have significantly reduced the impact of sharing tele-immersive information and are likely to have a longer-term benefit that is similar to that of selective audio encoding. Wu earned her B.S. at China’s Zhejiang University in computer science. Her research interests include multimedia systems, mobile/ubiquitous/wearable computing systems, wireless health, human-centered computing (including human-computer interfaces), distributed systems and perceptual computing. Other awards earned by Wu have included a Yahoo! Key Technical Challenge Grant, and second place at the ACM Student Research Competition, both in 2007. She also had one of the top three papers among 633 submissions to the IEEE International Conference on Multimedia and Expo in 2009. Wu has authored or co-authored more than 30 papers since 2006, which have been cited more than 275 times, according to Google Scholar.